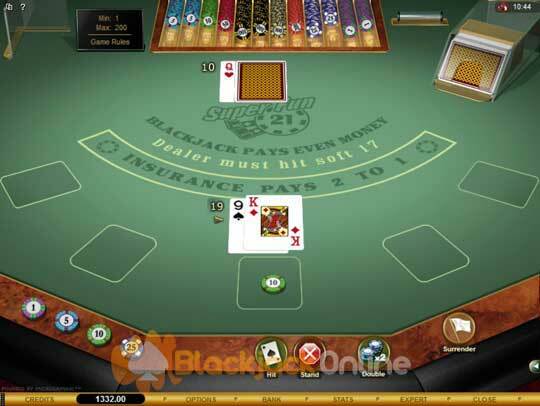 Many players like playing Super Fun 21 Blackjack not only due to the fact the a players Blackjack hand will always beat the Dealers Blackjack hand, but a unique set of payouts can be awarded when players have been dealt certain hand combinations. This game has just one deck of cards in the shoe, and this deck of playing cards is always shuffled before a new game is dealt out to player. The house edge of Microgamings Super Fun 21 Blackjack game is quite high and as such, when played with perfect strategy it works out at 0.94%. 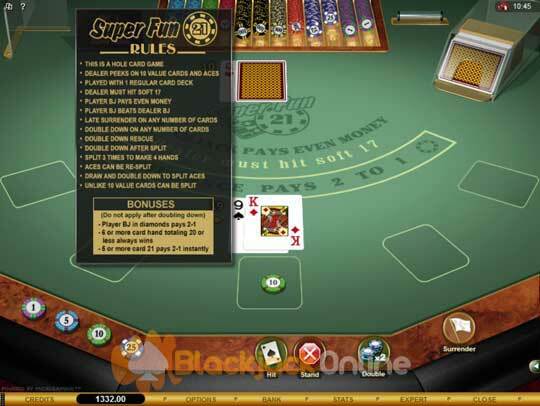 To enable you to play Super Fun 21 Blackjack with perfectly strategy feel free to download our Super Fun 21 Blackjack Strategy Card (see below) which shows you how to play every hand which you have been dealt by the dealer. Correct Time to Surrender - Occasionally you will be in a position where the best strategic move to make is for you to surrender your hand. But be aware there are only a few times when you should make this playing move. If you have been dealt a hard 16 and the dealer has a ten or you have a hard 15 or 16 and the dealer has an Ace then surrender your hand immediately. Also should you have been dealt a pair of sevens, and the dealer is showing a face up card which is either a ten valued card or an Ace, then surrender that hand also. Splitting a Pair of Nines - When playing Super Fun 21 Blackjack when you have been dealt a pair of nines, then the correct way to play this hand is for you to split it, the only time you should consider playing any other move is when the dealer has a seven or a ten card showing and you have a pair of nines, in such circumstances you should stand your hand. Dealer Rules - The game is a hole card game, if the dealer has either an Ace or a ten valued card he will check for a Blackjack. Any hand dealt to the dealer which is worth a soft 17 or below in value will see the dealer hitting that hand. Player Rules - Late Surrender is offered on any number of cards dealt, and you can double down on any number of cards, even after splitting, plus double down rescue is on offer. You can split a hand up to 3 times, even splitting Aces if you like, plus drawing cards, splitting and doubling down on Aces is also permitted. Payouts - There are several additional payouts which can be awarded to you when playing Super Fun 21 Blackjack, and these are paid without you having to have placed any type of bonus or additional wager. The main payouts include even money for all winning hands, and this includes Blackjack hands and the Insurance wager pays 2 to 1. The additional bonus payouts include a 2 to 1 payout if you get a Blackjack in the hand of Diamonds, also a payout of 2 to 1 is paid instantly if you get a hand valued at 21 with 5 or more cards. Should you get dealt a 20 or less valued hand with 6 or more cards in that hand, then it automatically wins.